Has your computer's hardware started freaking out, freezing up or behaving in weird ways since you've made the jump to Windows 8? Don't lay blame at the feet of a mischievous gremlin. Instead, it’s much more likely that your devices simply aren't rocking the most up-to-date Windows 8-compatible drivers. Yes, a simple driver update might just fix your Windows 8 hardware woes. Before you get your hands dirty, however, you should see if Windows Update has automatically checked for driver updates. Not all drivers are available through Windows Update, but many are and it’s the easiest way to proceed. To check, open the Charms bar and select Settings. 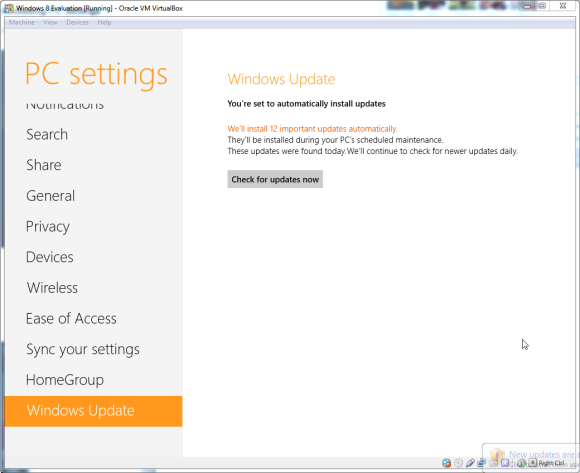 Then, choose Change PC Settings and navigate to the Windows Update settings menu. The only thing you can do here is click the Check for Updates Now button and see if it finds any. By default, Windows will install updates during your next scheduled maintenance—usually in the middle of the night—but you can force the updates to install post-haste by clicking on the link that tells you how many updates are ready to install. Windows Update can be found in your PC settings. If that doesn’t work, you will need to manually update the driver for your finicky hardware. To do that, you’ll have to use the trusty Device Manager. You’d be excused for thinking that the Device Manager would be found in the Devices tab of the Windows 8 settings menu, but it’s not quite that simple. Instead, you’ll have to launch it manually by returning to the Home screen and typing “Device Manager” then clicking on the Settings tab in the search menu. There you’ll see the Device Manager, which will launch in desktop mode. 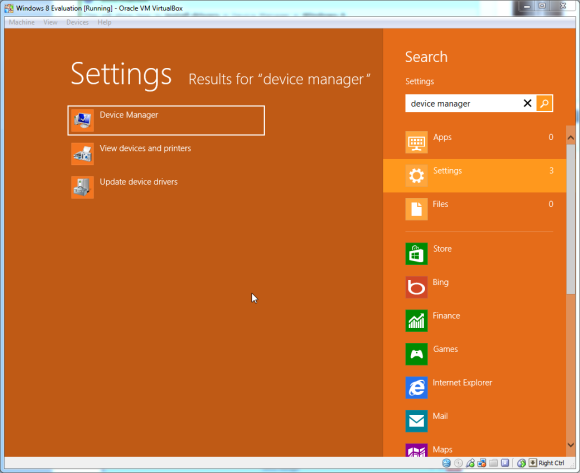 You can also scrounge for the Device Manager in Control Panel > Hardware and Sound > Device Manager. 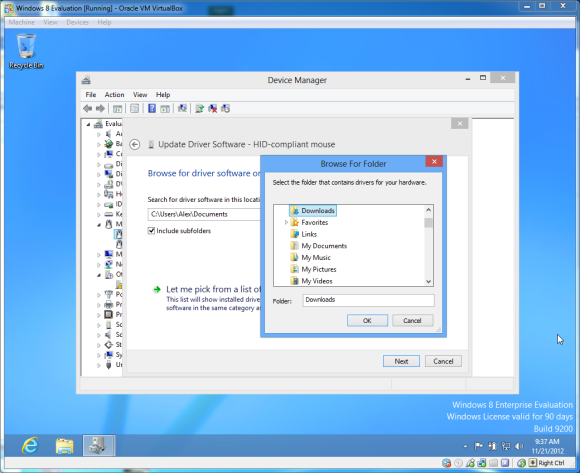 Finding the device manager is as easy as searching for "Device Manager." Actually updating a driver is simple. Just find the device you would like to update, right-click on it, and select Update Driver Software. You’ll have the option to have Windows search for drivers for you, but if you’ve come this far it’s likely that you’ll want to choose the second option, which allows you to manually select a location where you’ve downloaded drivers for your misbehaving device. Pointing Windows 8 towards a specific driver. What’s that? You want to know where to snag a specific driver? In general, you’ll find them at the manufacturer for your particular device. Here’s an index of download locations for common hardware, arranged by product type—laptops, motherboards, peripherals, et cetera—for your convenience. Not every manufacturer offers drivers that are specifically called out as being made for Windows 8, but if a given piece of hardware is giving your troubles after upgrading, it's a good idea to make sure you're running the most up-to-date drivers available. Use some common sense when it comes to driver updates, though. If your keyboard is working just fine, for instance, there’s really no need to spend the time tracking down and updated your driver and exposing yourself to the (small) risk that updating the driver will actually cause a problem. If you’re using a laptop, and your problem isn’t with an external device such as a mouse or external hard disk, your first stop should be at the website of your laptop’s manufacturer. Laptop hardware is often specialized, and drivers for specific drill-down components (such as the hard drive) typically aren’t available on the component manufacturer’s site. If drivers aren’t available at the laptop manufacturer’s page, they should at least have the exact model number for each component in the system, which will make your search go faster. If you have a desktop PC, your motherboard manufacturer’s site is an important stop. The motherboard’s chipset drivers may need to be updated, as might the drivers for integrated components such as the network interface, integrated sound or graphics, Bluetooth, or any pretty much anything else that’s listed as a “feature” of your motherboard. You can see the motherboard’s make and model number by physically opening up your computer and looking at it with your own two eyes, or by using a free software utility like CPU-Z. When it comes to graphics cards the most important thing to have is the latest driver from AMD or Nvidia, which controls the actual graphics performance of the cards. For features specific to your graphics card model—GPU monitors, overclocking utilities, and so on—check the website of your card's manufacturer. Like hard drives, optical drives generally won’t need a driver update except for bundled applications and utilities. Note that networking is usually handled by the motherboard network interface controller (or NIC), and in those cases the driver will be found on the motherboard manufacturer’s site. If you’ve installed a networking add-on card, however, you’ll find the drivers here. Hope that helps, and happy driver updating!